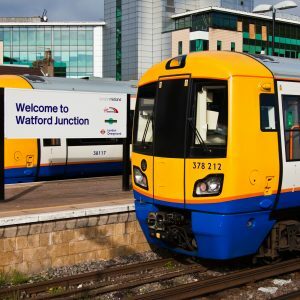 Haigh Rail was awarded its first contract with Network Rail as a Principal Contractor Licence (PCL) holder at Watford South Junction at the end of 2016. This success came only a few weeks after the announcement of the company’s provisional PCL status. After previous contracts working for Siemens on the Watford Remodelling Project, railway infrastructure contractor Haigh Rail acted as a Principal Contractor in its own right for the final quarter of the project. The scope of the works for the overall contract included the supply and installation of 180No hollow bearers. Haigh Rail delivered the full scope of works. The final quarter was particularly challenging, whereby Haigh Rail managed the installation of 37 hollow bearers, relocated a further 2 (incorrectly installed by others) and provided cable management to a further 12 (which were again put in by others, this time without the cables being installed). Haigh Rail also cleared the scrap with the use of an RRV to a designated access point. Haigh Rail was also responsible for the management of the lineside civil engineering works, which included constructing walkways and they also provided a clear and level site compound, which housed the appropriate welfare facilities for the duration of the works. The works were completed to the satisfaction of Network Rail during a series of midweek night and weekend possessions of the line. This is an outstanding achievement – one which is testament to the company’s wholehearted commitment to railway assurance.